Want to stay warm and toasty on a dive? Then dive dry. Yes! Unlike a wet-suit, a dry suit seals you off from the outside water and that keeps you warm! Even in surprisingly cold water. 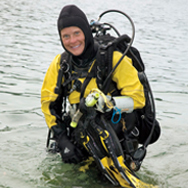 Undergarment options (fleece or overall-type garments worn under the dry suit). Be certified as a PADI Open Water Diver, Junior Open Water Diver or have a qualifying certification from another training organisation. Be at least 10 years old. The course consists of one pool dive and two open water dives.